I’ve always been a piss-poor SCRABBLE player, so it’s strange that I picked up this book about SCRABBLE tournaments and got totally engrossed in reading about the fanatical world of SCRABBLE players. Words With Friends has changed my attitude towards playing SCRABBLE, a game I’ve always thought as tedious. Words With Friends is easier to play, and always handy. I keep ten games going and make plays throughout the day. 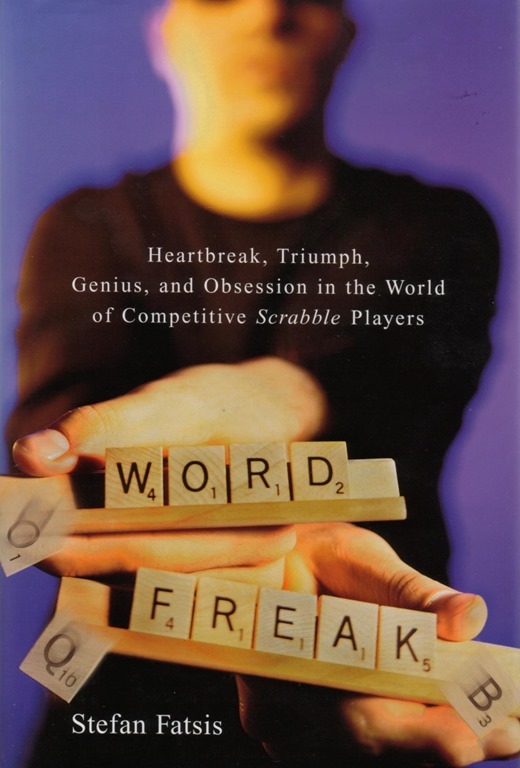 When I saw Word Freak: Heartbreak, Triumph, Genius, and Obsession in the World of Competitive SCRABBLE Players by Stefan Fatsis I bought it thinking it might help my game. Word Freak came out in 2001, but in 2011 it had a 10th anniversary edition, with a 30 page update. Because the Word Freak was so fascinating I went searching for more information about SCRABBLE players, and their tiny world of word geeks. I thought I’d collect what I found for a blog post, since I love reading about micro-subcultures. For some reason Word Freak just grabbed me and I couldn’t put it down. Stefan Fatsis, a reporter for the Wall Street Journal and NPR, started out doing a short article on SCRABBLE players, and their tournaments. Then he got hooked on competing himself. Word Freak is a memoir of Fatsis getting to know many of the major SCRABBLE competitors and his efforts to improve his own skills to get higher rankings in the tournaments. SCRABBLE players have a rating system somewhat like chess players. Fatsis started off playing in the 700s and by the end of the book was ranked 1697. He’s currently ranked 1597. Even if you hate playing SCRABBLE you might find Word Freak worthy of reading. Fatsis takes a complex subject and explains it in very clear details. Word Freak is really about three subjects that Fatsis weaves together. At one level the book is about the history of a game and how the tournaments work. At the next level its about lexicology and studying words. Finally, the story is about obsessive people, and how far they will go to become great at playing a game, and how that changes their lives. Reading the book does require some patience – it’s somewhat technical when it comes to words and wordplay. After reading Word Freak I checked Netflix and found Word Wars, available on disc and streaming. The documentary film by Eric Chaikin and Julian Petrillo credited Stefan Fatsis and Word Freak as their inspiration. 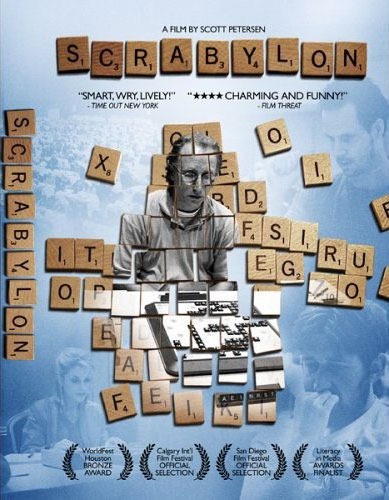 The film followed four players Joe Edley, Matt Graham, Marlon Hill and Joel Sherman for nine months as they prepared for the 2002 National Scrabble Championship. All four were profiled extensively in Word Freak, so it made me happy to meet them on film. Finally, I got to see Scrabylon, a film by Scott Petersen, which was made before Word Wars, but is pretty much about the same cast of characters. By now I was beginning to burn out some on SCRABBLE documentaries, but I still want more. I can’t help but wonder how things are ten years later? Are the old players being pushed out by bright new word freaks? 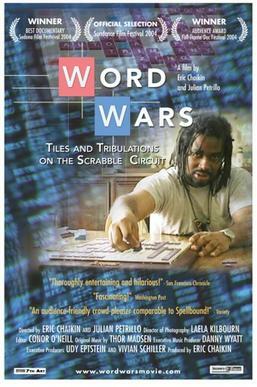 In the book and films, all the players talked about SCRABBLE tournaments becoming more successful, to offer bigger prizes and get more public attention. I’m not sure that’s happened. Quite often I have seen short pieces in the news about SCRABBLE championships, but they don’t reflect the hoped for growth. After reading the book and seeing these films I started thinking about my own skills. In Words With Friends I’m averaging about 22 points per words, but there are players that average over 200 points per word. I assume they are cheating, but maybe not. I win a lot of Words With Friends games, but I don’t think I’m a particularly good player. Reading Word Freak made me want to improve at Words With Friends, but maybe also play SCRABBLE itself, live with friends. Many people think they are playing SCRABBLE when they are playing Words With Friends, but it’s really two very different games. Which is why Words With Friends isn’t being sued out of existence. The boards are different, the tile values are different, the number of tiles are different, but most importantly, you have to know how to spell to play SCRABBLE, whereas you can endlessly guess in Words With Friends. In SCRABBLE you can intentionally play a phony word to bluff your opponent. But if she challenges you and the agreed upon dictionary supports her, you lose your turn. SCRABBLE is all about memorizing real words. Words With Friends is all about finding real words that’s acceptable to the game. You can try as many as you want. With SCRABBLE you only get one try. Words With Friends is also notorious for people cheating. Playing real SCRABBLE, with real people, with a real board, not in cyberspace, but real space, means you’re on your own to come up with words out of you’re own little brain. When I get together with someone to play SCRABBLE my average word values go way down, and it feels like I’m straining my brain to play. Chess is a game that is all skill. SCRABBLE is a game that involves a huge amount of luck with a lot of skill. SCRABBLE appeals to more people because it is accessible, and easier to play than chess. Words With Friends is even easier and more accessible than SCRABBLE, which explains its huge success. Tournament SCRABBLE players often whine about the poor tile combinations they pulled from the bag, but the real experts can use their tremendous word knowledge to make a bad rack of letters into a high scoring word. That’s why they memorize tens of thousands of obscure words. Knowing words and how they can be played in novel combinations in a board arrangement can thwart an opponent’s “lucky” streak of drawing good letters. Professional SCRABBLE tournaments use various standard dictionaries. Players spend time every day learning the words in those dictionaries – often without learning their meanings. Because English is a world-wide language, SCRABBLE is even played by people whose first language is not English, deciding on an official dictionary is difficult. Basically it breaks down into three groups of English words. Tournaments in the U.S., Canada and Thailand use the Official Tournament and Club Word List (TWL) (178,691 words). For international play, SCRABBLE players use SOWPODS, which combines American and British words (267,751 words). Players using SOWPODS have more words they can play, but it also means potentially memorizing almost a hundred thousand more words. This also makes it difficult for world players to compete in America, because they need to know which words not to use, or for Americans to compete internationally, which means they need know all the additional words that can be used. Plus players need to know when to challenge a phony. For non-professional, home players of SCRABBLE, Hasbro recommends The Official Scrabble Players Dictionary (OSPD), now in the 4th edition. The OSPD doesn’t have “offensive” words in it, which many professional and amateur players like to reply on. Strangely, the internal dictionary for Words With Friends allows some offensive words and not others. Because on July 1, 2013, Hasbro, the American maker of SCRABBLE, is dissolving the National Scrabble Association (NSA), which it has hosted for 25 years, things might change. Since 2009, North American tournament SCRABBLE is organized by the North American Scrabble Players Association (NASPA). Here is NASPA’s most recent statement on word lists. Word Freak has an extensive discussion and history of SCRABBLE players struggling to come up with an official dictionary. It’s a fascinating problem. Words are constantly added to the language. Words also go out of favor, but should they be removed from the official dictionaries? Players want to use them. As SOWPODS grows, the number of playable words grows, which makes it harder and easier for players. It’s much easier to build elaborate tile combinations if they get to use all words, but at some point many of the words look like gibber-jabber. Now, I’m not a tournament player, so my opinions don’t count. But while reading Word Freak I was appalled by herculean efforts some professional players go to memorize words. If all the top players have to become Rain Man to compete then it makes the idea of tournament play far less appealing. It also bothers me that the players aren’t required to know the definitions of the words they play. Professional SCRABBLE players spend hours a day learning words, usually from word lists. 2-letter, 3-letter, 4-letter lists, and so on. Or from lists of special words, like all the Q Words, or Q Words Without U. Most non-tournament SCRABBLE players eventually get around to memorizing short lists, but few people have the stomach for the long lists. That’s what separates the living room players from the rated players. Tournament players often print out long lists of words, thousands and thousands of them, and cut them into flashcards, so they can study them a hundred at a time. I would never do this. I’m surprised by how much memorization Stefan Fatsis had to pursue to write his book and become a expert player. I think it’s the willingness to study the long lists that separate merely great players from wannabe tournament champions. Another astonishing feature of word power shown by professional SCRABBLE players is their ability to anagram verbally. You know how parents often spell out words in front of young children so kids won’t know what the grownups are talking about, well, I’m 61 and if people verbally spell out words I don’t understand them. So it blows me away that these SCRABBLE players can spell out 8, 9, 10, 11 or more letters and they can anagram them in their heads. Fatsis reported that the tournament players often sat around playing anagrams after the tournament ended each night. But Fatsis was also told that learning to anagram was a key tool to learning to compete in SCRABBLE competitions and raising his competitive rating. Another big difference between living room players and tournament SCRABBLE players is their ability to plan ahead, and especially, plan their end games. Competition level plays constantly seek to get Bingos – playing all seven letters from their rack at once. Great players track the titles played and know which letters might be in the bag or on their opponents rack, and they often play short words one round in hopes of pulling the letters to make a bingo in the next round. Average Words With Friends players love getting the Q and J because of their 10 point values, but competitive SCRABBLE players often consider these letters a burden. They’d rather get letters, with lesser values, that help them make bingos. They are always collecting prefixes and suffixes thinking about 7 letter words + 1, those words that can be made from 7 letters on the rack and hooked to one letter on the board. They especially love making 8, 9, and 10 letter words by playing 7 titles across three lines of words. You can follow the game where Mark Landsberg achieved the highest score ever to see how such strategy works. Visit cross-tables.com to follow games, tournaments, strategy and tools. If you really want to get caught up in SCRABBLE competition you can read The Last Word newsletter or join SCRABBLE Club or Internet Scrabble Club. Word Freak chronicled Fatsis meeting many champion players and their own personal strategies they used to win. Most of their strategies involved game play or word study, but sometimes it involved brain drugs, meditation, positive thinking, attitudes towards winning, and even methods to achieve Zen-like flow. I still enjoy Words With Friends, but I think I need to switch to SCRABBLE. I know I will never push my mind to be a SCRABBLE champion, but I do think I should push it to memorize words. I have started paying more attention to word spellings as I read books. Like I said earlier, I was disappointed that SCRABBLE masters don’t focus on word definitions. Stefan Fatsis spent a lot of time in his book dealing with word play and it made me want to study words more, maybe even read some books on lexicology. I think I’ll start with Word Buff. I won’t be making lists of words to memorize, but I might start studying words in general, and their definitions. Reading Word Freak and watching these documentaries made me aware of my wimpy vocabulary. My wife Susan has always loved anagrams, crossword puzzles, and other word puzzle games, and she’s always been much better than me at SCRABBLE and Word With Friends. That book really made be a much better Scrabble player. Ever since I read it when it first came out I’ve been more focused on making Bingos and memorizing the small words and the Q words. But I’ve never been into it for more than a month or two at a time. I enjoy playing the game, but I have no sense of commitment. It’s always a passing fancy. When my friend and I play we play a very loose game. We have the Scrabble dictionary in front of us and we can skip through it if we want to check on a word. I’ve gotten very good at finding words I had no idea existed, but just sort of guessed might. Next Next post: What Makes You Cry?